Cut 2 - 16 or 17 inch strips of fabric from each yard (you may even be able to cut it up to 18" wide depending on how generous your fabric store was while cutting). You want to cut across the width of the fabric, which will leave you with 2 ~16"x52" strips of fabric. Turn the fabric tube right side out and press. Now turn the unfinished short ends in about 1/2" and top-stitch them closed. 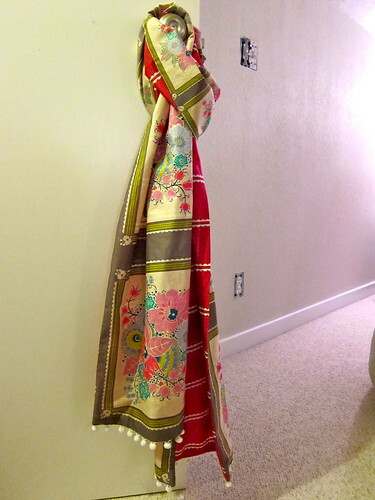 You can even add a fun trim like the pom-pom trim pictured below (this scarf I made for myself). Nice one. 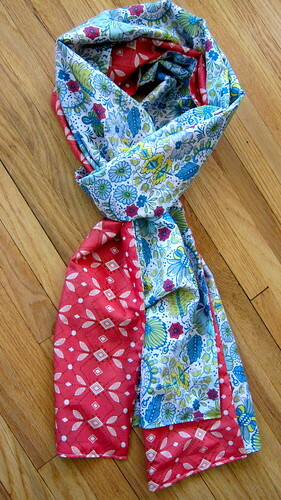 I can use this as a head band which not too many people can pull off a hippie-style headband.